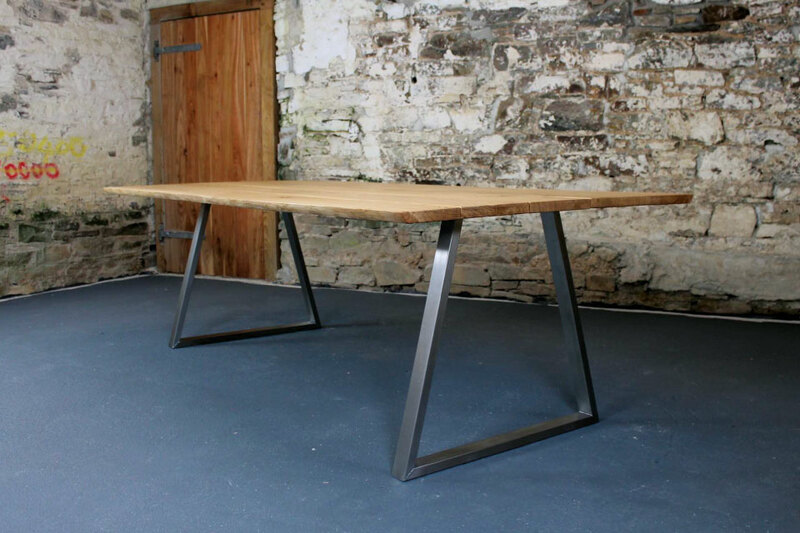 The Piranha table is all about cut-throat simplicity, letting the materials do the talking. With perfect geometric symmetry, the Piranha’s fish-tail base can look equally strong and sleek from different angles around the table. A combination of man-made and natural engineering, customised by you to create a unique table that perfectly fits the size and style of your room. For an authentic natural feel, choose a live table edge where the outside edges of the table are taken from the outer curve of the tree trunk, hand-finished to a beautifully smooth and incredibly tactile surface that you won’t be able to take your hands off. 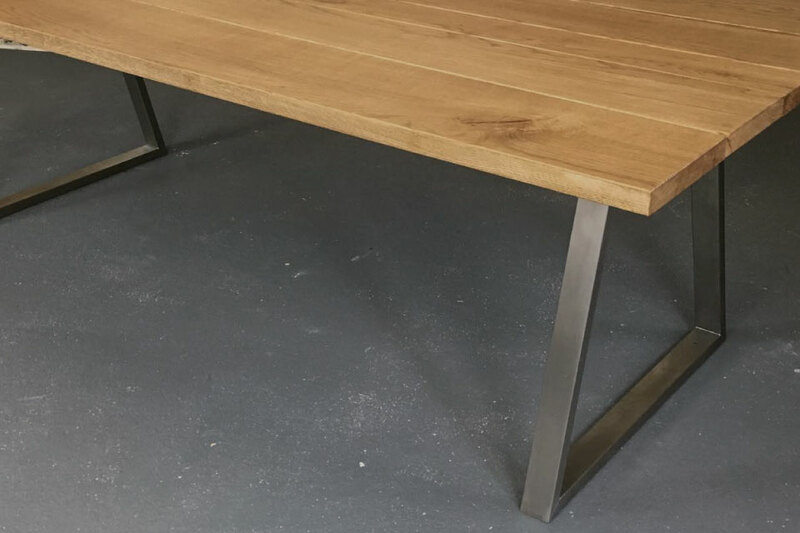 Or the clean lines of our traditional straight-edge table tops are hand-finished, which you can choose with either square angular corners or a smooth radius corner design. Finally the Abacus Knife Edge has a steep precision engineered angle that gives a cutting-edge table top profile unlike any other. The Piranha table’s minimal-style has been designed to exhibit a sleek and contemporary table top. You can tailor the Piranha’s signature fish-tail steel base with the exact finish to fit the style of your room. Choose either hand-brushed high-grade stainless steel base finish, or from our huge colour palette of durable matt or high-gloss powered coated finishes. Tailor your Piranha table top to fit the style of your room and the way you want to use the table. 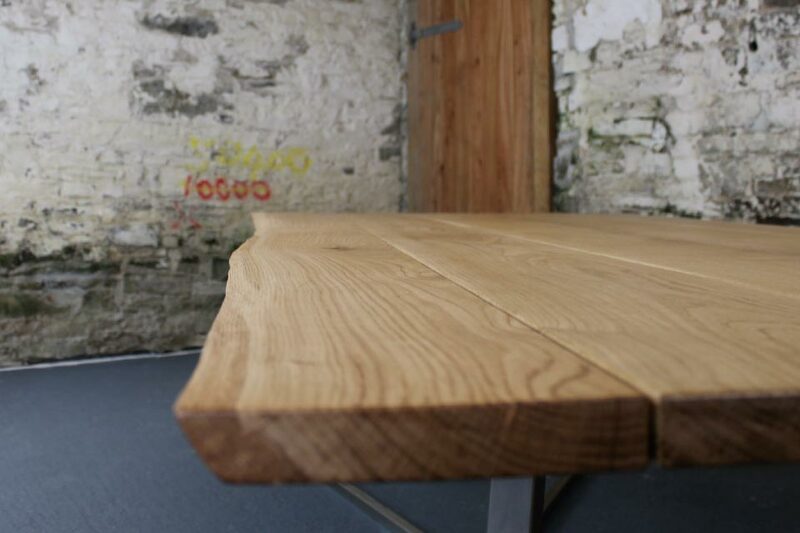 Our Real Oak table tops are something quite special, made from individual pieces of premium quality French oak that come from a single tree, exhibiting the beautiful natural grain of the wood flowing unbroken along the entire length and thickness of the table. Or for a highly durable contemporary-style table, we have a high-performance Formica surface on a core of finest Beech ply that comes in a huge array of stunning matt and high-gloss colours and textures.